Last week was a fine week of vacation for me and my lovely wife. We both enjoyed a much needed time of relaxation and care-free leisure. 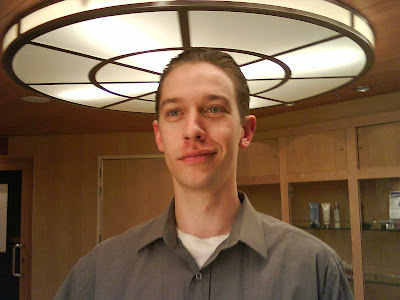 Of course I’ve already blogged a bit about the first day of our trip in Vegas and my bowling exploits but before I finish that epic up I thought I’d offer a little tidbit from the beginning of the trip (my dramatic haircut) and a tidbit from the middle of the trip (my dramatic shave). Those that know me could probably remember the days when my hair wasn’t so long. A few years back my hair was quite short and then one day this girl told me she liked guys with long hair. Needless to say the past three years my hair has been long… but at least I got the girl. :) Not so anymore as on Friday the 13th I decided finally to hack it back to what it was a few years back: Proper. Ohh, and it feels so good too. Flor of course was very supportive of the move (despite her liking men with hair) and later in the week she decided that I needed to complement the new do with a fine shave. 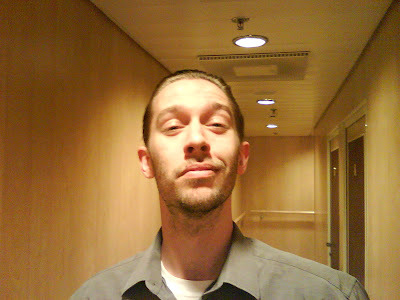 She purchased me a wonderful facial, shave, and scalp massage while on our cruise this past weekend. Now, I’ve been shaved before but not by someone else. It was so weird having someone else holding a blade to my neck. Anyway, I thought I’d share my post-haircut / pre-shave picture followed by my post-shave pic. Then feel free to check out my fantastic commentary on the shave last Friday evening the 20th.